​(For production rights, contact Toochis Morin at the Brant Rose Agency. Read excerpts at the New Play Exchange. A postmodern adaptation of the myth of Ariadne: Prince Theseus promises to marry Ariadne if she helps him through the labyrinth to kill her half-brother, the Minotaur. Mission accomplished, he abandons her on a desert island, where for the last 3000 years, she’s been waiting tables in a diner at the end of a battle-worn world. What is the price of love and war? Production: Festival51, RI, (2015). Cutting Ball Theatre (2008, 2010). Best of 2008, San Francisco Bay Guardian. Watch Daphne and Bessie, two seventy-something Chinese American ladies-who-lunch, duke it out for the pride of paying the bill at their weekly gossipfests—until a man comes between them. A hilarious comedy about old pals and new enemies—boxing match and sight gags included. Production: Centenary Stage (2008). Workshop: Centenary Stage (2008). 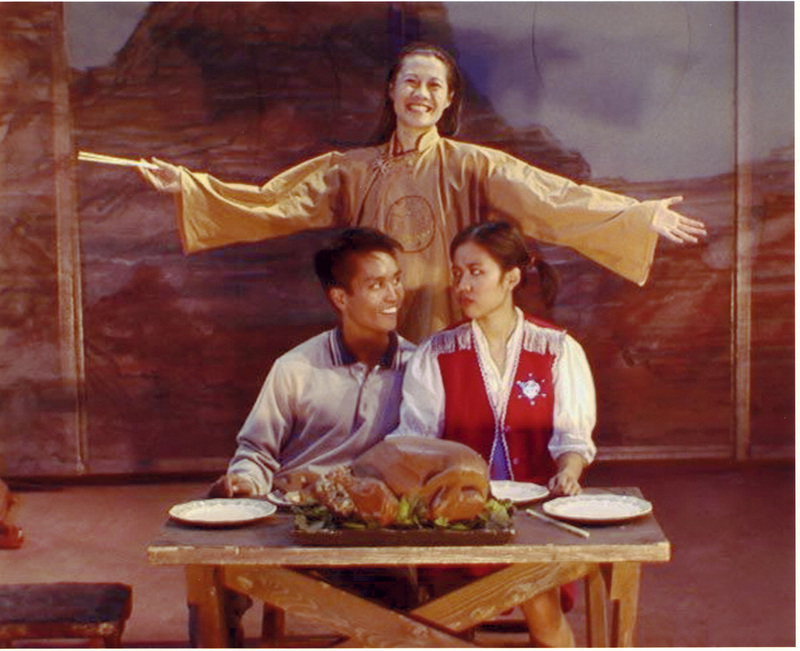 Jose Abaoag, Vera Wong, and Mona Armonio Leach in Rancho Grande, Northwest Asian American Theater, 1997. The desert southwest. A single smoking campfire. Above, two Chinese gods, Oxboy and Moon Lady, fly in the night sky. Below, young Mamie dreams of having a baby. But with no one to turn to except her oddball pioneer family and the flighty gods, what’s a Chinese American cowgirl to do? A Chinese American Western, complete with wordplay, stunning visuals, the iconography of the West, and gunshots. Productions: Thick Description (2001); Northwest Asian American Theatre (1997). Workshops: PlayLabs (1995); Bay Area Playwrights Festival (1994). Staged readings: East West Players (1993); Pan Asian Repertory (1992). Workshop: Seattle Group Theatre (1992). Winner: Mixed Blood vs. America Playwriting Contest (1994). Set in the high drama of the telenovela, blonde Chinese diva Marlene, puts her tuxedoed daughter, Izzy, through the paces of courtship. Izzy loves Carlos. But Marlene loves Carlos too. More important, will Carlos ever come? Only Olga the maid knows. A dizzying vortex of gender, culture, and mother-daughter competition. Productions: City College of San Francisco (2001); Perishable Theatre (1996); Brava! For Women in the Arts (1994); Columbia University (1993). Workshop: The Public Theatre (1993). Staged Reading: Duke University (2005). Staged reading: Self-Help for the Elderly, San Francisco, 2009. Commissioned by The San Francisco Foundation and Grants for the Arts/San Francisco Hotel Tax Fund through support from The Wallace Foundation. Staged readings: Marin Academy (2008); Duke University (2005). Rowena, a former Red Guard turned tour leader, takes a group of American tourists to Tiananmen Square. But the simple expedition turns into a dangerous confrontation with the ghosts of the Tiananmen Massacre Democracy movement. Workshop: Cutting Ball Theatre (2004). Staged Reading: Bay Area Playwrights Festival (2003). Cinestory Finalist (1997). Nicholl Fellowship Semi-Finalist (1993).